during the Tribulation period can still be redeemed. JOHN: “Yes, I think, you know, in the seven-year Tribulation coming in the future, we’re gonna get into this, so probably a week from Sunday night, maybe this Sunday night, maybe a week, I’m not sure. But the Tribulation is a seven-year period, right? The Rapture of the church, seven-year Tribulation, then Christ returns, sets up His Kingdom. Now, in that seven-year period, really two things happen. God begins to judge the world in...with a series of holocausts; and, at the same time, He begins to redeem His people Israel; and in the process of this, the antichrist establishes his rule; and in order to function in the economy of the antichrist, you have to take the mark of the beast. The mark being the number of a man, Revelation 13, 666. Six is the number of man, right? Seven is the number of perfection, and man always falls short of perfection, 666, always sixes, never seven. So the number of a man, and apparently what’s gonna happen, you take the mark on your hand or on your forehead; and we’ve talked a lot about that, you know, that...that that’s kind of the computer situation. We’re now moving fast toward the time when we’re going to have to do everything we do by cards and by numbers and all of that, and those number...the thing about a card that’s a problem is you lose it, and they’ve already devised systems to put the number on your hand and on your forehead, and you go through a scanner and, you know, that’s how you buy and sell. It’s automatically deducted from your bank account. John MacArthur introduced this “damnable heresy” in 1980, and he has issued no retraction since then; yea, MacArthur’s propaganda ministers defend him and his false teaching, and discredit those who expose it as deception. 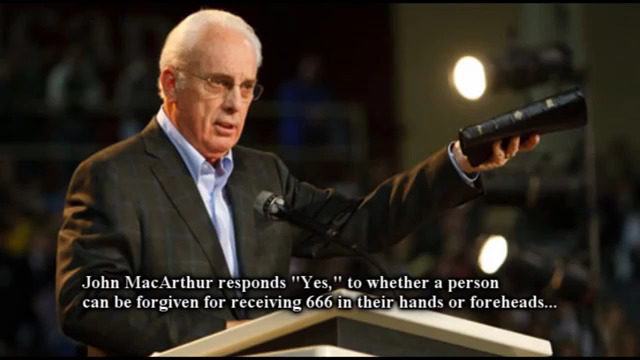 John MacArthur’s statement regarding the mark of the Beast is deceptive on more than one level. First, he does not accurately identify the mark of the Beast, but implies that it will be a computer generated bar code. However, a bar code or microchip implant does not fulfill the Scriptural requirements for the mark of the Beast. MacArthur was right that God would not sentence a person to eternity in hell for merely trying to survive in the world system, which may soon require taking a bar code or chip implant. Receiving the real mark of the Beast will involve a far more serious sin. The mark of the Beast will be an occult symbol branded or tattooed on the forehead or right hand of those who take an oath of allegiance to Lucifer during an initiation ritual, similar to initiations performed in secret societies like Freemasonry. The occult symbol that fits the Scriptural description of the mark of the Beast will be the star which represented a pagan idol worshipped by the ancient Israelites. The worship of this pagan god involved the most abominable rites, of sexual perversion and human sacrifice, for which God severely judged the Jewish nation. Please refer to the following articles for more Scriptural evidence that the mark of the Beast will be a tattoo or brand of the 6-pointed star, euphemized as the Star of David or Seal of Solomon, but in reality the mark of Lucifer. THE 6-POINTED STAR: THE MARK OF THE BEAST ~ The Star of David or Star of Remphan? “In some pictures of a tattooed man we are faced by a permanent prayer to and identification with the heavenly powers, at the same time as a basic means of communication with them. Such is the most generalized meaning of tattooing bestowed in consequence of a rite of initiation which allows this communication to take place. At the same time, this initiation is a rite of admission into a social group and the tattoo is the permanent mark of that initiation, the badge of the tribe. Like a wedding band which symbolizes the indissoluble union of a man and woman, the initiate’s tattoo “becomes a badge of fealty” to the “creature or thing to which that person is assimilated.” Since Lucifer aspires to be “like God,” in his pride he will enter into a union with his devotees in a Sacred Marriage Ritual—a Satanic counterfeit of the Marriage of the Lamb, the Lord Jesus Christ, to His Bride, the Church (Revelation 19:4). Christians have been misled to believe that the mark of the Beast will be the microchip implant. When this counterfeit mark arrives on the world scene, multitudes will choose to starve to death rather than receive it; which will save the perpetrators of the global conspiracy the trouble and expense of exterminating them by other means. Many church members, however, will take the chip implant with the idea of repenting later, since popular ministers like John MacArthur have assured them it is possible to still be saved. These church members will then be told that genuine repentance requires receiving the “Seal of Solomon” or “Star of David” on their right hand or forehead. By means of this deception, the real mark of the Beast will be willingly received during initiation ceremonies performed in churches as well as synagogues, temples, mosques, shrines, groves and other sacred sites and places of worship. Theosophist Alice Bailey disclosed in her 1957 book, Externalisation of the Hierarchy, that the Church and the Masonic Fraternity will be centers for initiations into the Mystery religion of the false Christ. “The Mysteries will be restored to outer expression through the medium of the Church and the Masonic Fraternity... When the Great One comes with His disciples and initiates we shall have...the restoration of the Mysteries and their exoteric presentation, as a consequence of the first initiation... the Christ...is the Hierophant of the first and second initiations and He will, if the preparatory work is faithfully and well done, administer the first initiation in the inner sanctuaries of those two bodies.” (Externalisation of the Hierarchy) 1. 1 And I heard a great voice out of the temple saying to the seven angels, Go your ways, and pour out the vials of the wrath of God upon the earth. 9 And men were scorched with great heat, and blasphemed the name of God, which hath power over these plagues: and they repented not to give him glory. 11 And blasphemed the God of heaven because of their pains and their sores, and repented not of their deeds. “And when Pharaoh saw that the rain and the hail and the thunders were ceased, he sinned yet more, and hardened his heart, he and his servants. “We must carefully notice the way that the serpent went to work. It will not only instruct but also forewarn us, for his wiles are always similar. He aimed to undermine the creature’s confidence in the Creator, labouring first and foremost to produce distrust of God. “He took three steps to accomplish this. “The first was the questioning of Divine Revelation. ‘Yea, hath God said?’ were his words. He knew that if once the word of God were weakened in the woman’s mind a breach would be made in the walls of defence. Notice that he misquoted the words in order to question it, ‘Yea, hath God said, Ye shall not eat of every tree of the garden?’ The woman corrected his misquotation but herself exaggerated the Divine prohibition, adding the words, ‘neither shall ye touch it,’ to what God had said. This proved that the poison of doubt had begun to work in her mind. “Following up this initial advantage the serpent said, ‘Ye shall not surely die,’ thus denying the threatened penalty of ruin and death and giving the lie direct to God. He represented God’s judgment as being but an idle threat. “Thus far the serpent had dealt in negatives, but now he comes to a positive assertion and dangles before the woman’s mind a tempting bait. ‘Ye shall be as gods,’ were the words by which he asserted deity for man as the result of disobedience, and he insinuated that God knew that this would be the result of their eating of the forbidden tree, and that the real reason why the prohibition was given was that He desired to withhold from them this coveted prize from motives of jealousy. “Even the devil, however, does not trade in nothing but lies. He added the words, ‘knowing good and evil’ (ver. 5), which was true as far as it went. He did not add that they would only know both in finding themselves under the power of the evil and without desire for the good. Facts partially stated often do efficient service in an evil cause. “(3) Asserting deity for man. John MacArthur has, in fact, written a book which teaches that the Christian’s relationship to God is one of abject slavery. This strange book is largely based on the heretical and blasphemous teachings of anti-Christian scholars whose own books portray God as an evil slave driver who abuses his Christian slaves. The next four sections of this report are an in depth analysis of John MacArthur’s heretical book Slave: The Hidden Truth About Your Identity in Christ. 1. It is probable that the Luciferic initiation will take place on a global scale during a counterfeit Christian feast, such as Christmas which is a Christianized version of the pagan Saturnalia, the festival of Saturn. The Christmas season would be ideal for the Luciferic initiation because nearly everyone who has survived the global holocaust will be observing some form of the pagan Saturnalia Festival, a commemoration of the pre-flood era, Atlantis, which was ruled by the god Saturn. 2. The ‘Ritual of the Mark of the Beast’ which is performed at the Wiccan PantheaCon in San Francisco is designed to invoke the energies of the Aeon of Horus’, the Sun-god who rises from the dead as the reincarnated Osiris during the Saturnalia, which is the Christmas season.